Common whipping is an easy and classic way to whip. 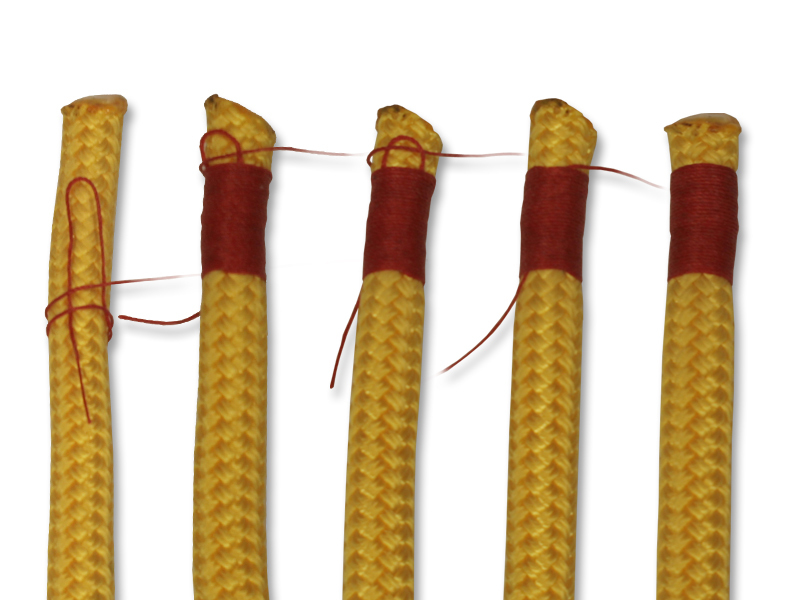 It keeps the end of your rope from fraying without having to use a needle or palm. Common Whipping can be used on any type of rope, but works best on a braided line. TIP! Use this whip anywhere along your line to mark a certain spot. 1. Create a loop at one end of your whipping twine a place the loop towards the end of your line. The closed end of the loop should be facing towards the tail of your line for secure whipping. You’ll only need a short tail on the end of your twine. Turn the working end of your twine around the rope, crossing over the twine to catch the loop underneath and hold it in place. 2. Keep making whipping turns until your whipping is at least 1.5 times as long as your rope is wide. Make sure you still have a bit of loop popping out of the top. 3. Tuck the working end of your line through the loop and pull it tight. 4. While holding the working end tight, pull on the short tail in your twine at the bottom of the whipping to tuck the loop into the whipping. 5. Trim off both tails as a finishing touch.